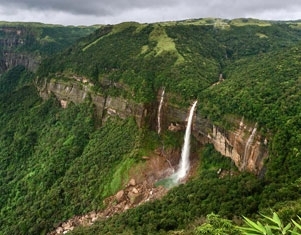 Hidden away in the subtle hills of eastern sub-Himalayas is Meghalaya, one of India’s most beautiful state. It is a land blessed with bountiful rainfall, sunshine, virgin forests, high plateaus, breathtaking waterfalls, clear rivers and meandering streams; a land of ancient cultures where the people are smart, intelligent and friendly. After breakfast excursion to Jowai (via Northing) (65 kms / 2 ½ hrs drive) ,Jowai (or Jwai) is the headquarters of Jaintia Hills district of the state ofMeghalaya. Jowai is the home of the Pnar Tribes one of the most prominent and friendly tribes. Back to Shillong , Overnight stay at hotel. After breakfast excursion to Mawsynram (60 kms / 2 hrs drive – one way).Mawsynram of Meghalaya is located at a distance of 60 kms from Shillong.It is situated around 1 km towards the north of the village of Mawsynram. This place is famous for the gigantic formation of stalagmite, whichresembles the shape of a 'Shivalinga'. Overnight stay at Shillong. DAY 6 : GUWAHATI AIRPORT DROP.